I'm watching an episode of Missing, a show focused on missing or kidnapped people. These events are often disasters in their lives. Speaking of disasters, have you seen the Lincoln MKS ads? They chose Major Tom as the theme music. To launch a new car, they chose a song about a failed space mission where the main character, Major Tom, drifts off into space, presumably to his death. Do you really want to associate your new car with major vehicular failure and driver death? We had to circle the airport for about 45 minutes due to these thunderstorms. They weren't letting anyone land. We got lucky, though. One of my colleagues was due to land at MSP at about the same time. Unfortunately, they had a longer flight and had to divert to Iowa when they started to run low on fuel. The coolest thing to happen to you US government and a US corporations this week had nothing to do with the Treasurey Department. It had nothing to do with the FDIC. It had nothing to do with the SEC. It had nothing to do with the bailout. It had nothing to do with the Jim Lehrer hosted debate between Obama and McCain. It didn't happen in Washington or New York. On a sunny island on the Pacific Ocean, SpaceX made history on 2008-09-28. It became the first private company in the history of the world to put a vehicle in orbit around the Earth. A successful private space industry has the potential to lower costs and make space more accessible to people and corporations. It has the potential to help NASA bridge the gap between the retirement of the space shuttle and the launch of its successor. It has the potential to free NASA from the business of taking short trips to Earth orbit and enable it to dream big with planetary and deep space exploration. A new era in space travel starts...now. SpaceX has made history. Its privately developed rocket has made it into space. Eight minutes after leaving the ground, Falcon 1 reached a speed of 5200 meters per second and passed above the International Space Station. With Flight 4 under its belt, SpaceX is gearing up for additional launches in 2009. Flight 5 could fly as soon as January, Flight 6 parts are on order and Flight 7 production will begin in early 2009. In addition to Falcon 1, SpaceX is planning a second model two-stage, Merlin-powered rocket known as Falcon 9. It is expected to cost $35 million USD, and is designed to boost 9,900 kg to low earth orbit, and 4,900 kg to geostationary transfer orbit. SpaceX is also planning a Falcon 9 Heavy model capable of carrying bigger payloads, and also a space craft with a pressurized cabin unit known as Dragon. This is pretty impressive. Thanks for the link, Jon. It's five mintues long, and safe for work (SFW). The producer took William Shatner's version of Common People and matched it up with scenes from Star Trek: The Animated Series. When Phantom of the Opera first opened on Broadway, it quickly sold out. I recall hearing stories of people waiting more than a year to get tickets (though the years may have dulled the accuracy of that statement). In the years that followed, I heard the music everywhere, but I never made it to the show. Tonight, though, I did catch the Seattle stop of the latest tour. Phantom has been playing to sold out crowds at Seattle's Paramount theater for nearly a month now, and has just one more week to go on the current stop. I was lucky to catch it when I did. The music in the show is great, and the costumes are beautiful. I've listened to the show on CD multiple times, but it's tough to really get a handle on the show's story without seeing it live. That live performance is the key to contextualizing the music. 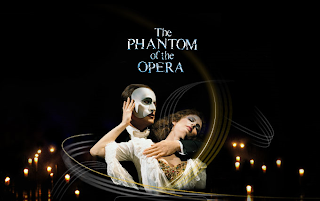 Phantom is all about the spectacle, from the big, memorable songs, to the pyrotechnics, to the the swinging chandelier. Those elements, along with a solid cast carry the show. That's fortunate, because while I enjoyed the show overall, the story was bit week. There are scenes that go no where. For example, the read through of the new play in the second half could probably be cut without hurting anything. There are several interesting secondary characters that seem to be left hanging. For example, the Dance Captain is tough, but does help the hero. The story implies there is more to her than we see, but never goes into detail. She seemed particularly interesting, but there is no exploration of her character. Christian's dancer friend also seems interesting but nothing happens. An shorter, 90-minute version of the show plays in Vegas every night. When I first heard about that, I though it was rather silly to cut it down like that. After seeing the show tonight though, the Vegas cut makes sense. Phantom just doesn't seem to have enough story to adequately fill its 2.5 hour run time. Despite those quibbles, this is still a great show. And now the music makes much more sense. On Wednesday, McCain claimed he was suspending his campaign because of the challenges facing the economy. He felt he needed to go to DC to work on the issue. Of course, as the Obama campaign pointed out, their candidate can multitask, which is really what a President should be able to do. But as part of this suspension, McCain decided to cancel his appearance on the Late Show with David Letterman. According to Letterman, McCain canceled so he could rush off to DC. Of course, he didn't do that. He went to an interview with Katie Couric instead. But Dave's reaction to McCain Wednesday night made headlines. Dave went on one of the funniest rants I've seen in ages. You can see the video here. Dave made two points. First, he showed how the McCain staff way lying to him about rushing off to the airport. But on the bigger question of suspending the campaign, Dave pointed out that if McCain had to run off to DC that's fine, "but you put in your second string quarterback." You don't quit. Why didn't Palin step in and campaign? Why didn't she take on the high profile McCain appearances? It seems like McCain would rather suspend the campaign in this tight, important race than trust it to Palin. How can he claim to trust her to be President, if he won't even trust her to run the campaign in his absence? Letterman called McCain "a true American hero" but told his viewers: "This is not the John McCain I know, by God. It makes me believe something is going haywire with the campaign." Instead of suspending a campaign, Letterman said, a presidential candidate should go to Washington to deal with a crisis and let his running mate shoulder the burdens of politicking. "That's what you do. You don't quit. ... Or is that really a good thing to do?" Letterman said, a reference to McCain's running mate, Alaska Gov. Sarah Palin. "What's the problem? Where is she? Why isn't she doing that?" he asked. McCain told the CBS show that he was immediately flying back to Washington, Letterman told his audience. Then Letterman showed a TV feed of McCain being made-up for an appearance on news anchor Katie Couric's "CBS Evening News." "Doesn't seem to be racing to the airport, does he?" Letterman said. "This just gets uglier and uglier." This whole campaign suspension was handled terribly by the McCain campaign. The new provost at Washington State University has been placed on paid personal leave at his request, school officials said. Steven L. Hoch, made the request less than two months after taking the job. No reason was announced. The leave is indefinite and Hoch will be paid, Tinney said. Damn. I want paid, indefinite leave, too, should life events ever make that necessary. Of course, I'd rather not have the life events that make it necessary, but that's beside the point. What is Marriott trying to tell me? A recent article in the Seattle Times addressed Bungee Jumping and the Walk of Shame. Mount Hood bungee tower's "Walk of shame"
There are no refunds, so those who pay — to borrow a phrase from the Van Halen song — might as well jump. But it can be intimidating to stand up there looking straight down at the huge air bag on the ground far below. Some take a long time to attain the right state of mind for the jump. Or to forget it and take the walk of shame. "One guy did seven jumps in one day," said Greg Aldrich, a manager at the adventure park. "People are really confident after one time. But I've also had the burliest of men go up there and walk back down. We give everybody a lot of time. We're part motivational speakers and life coaches up there." Rory Mehlman, a 27-year-old from Brightwood, decided she would try it. Her harness clipped onto the bungee cord, she stood on the edge of the platform, trying to summon the courage to leap. "Come on, Rory!" her friends shouted from below. "Why did I do this?" she asked no one in particular. "Is it better if you close your eyes or not?" Finally, she said solemnly, "I can't do it." With that, she stepped away from the brink and made the long, slow walk down the steps of the metal tower. That would make them some of the least expensive life coaches and motivational speakers on the market. Actually, being a motivational speaker sounds like a fun job. But that's not what I'm posting about today. This story took me back to the summer of 1992. I stopped outside of Chicago on my way from New York to Helena, MT. I had some friends to visit in the area, and we decided to go bungee jumping. It cost about $80. The jump was from a bucket hung from a crane over a lake. 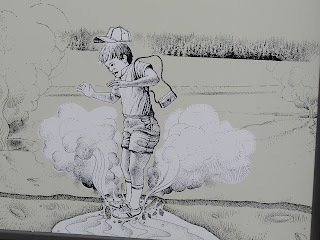 As we rode the bucket up, my main thought wasn't that the rope would fail, or that I would hit the water. I was worried about swinging wildly and smacking into the crane boom. After a few tense moments, we reached the top. I stood on the edge of the bucket and looked down. It was a lot further than I thought. I began to feel this was a big mistake, and seriously considered riding the bucket down, instead of the elastic. But I knew the people I was there with. And they knew me. And we would all remember this. So I calling on every last ounce of male ego, I decided I would be too embarrassed to ride back down. To save my pride, I stepped a little further out on the edge of the bucket and jumped. I attempted to swan dive, but, since I have all the grace of several large stones, I instead jumped straight forward with my hand held stupidly above my head, like Wylie Coyote dancing as a crazed ballerina pirouetting off the edge of the cliff. Like the Coyote, though, I was going down, silly moves or not. As I plummeted toward the water, I let fly a spray of expletives that even I had never heard before. At moments like that, the minds dips into the Jungian world of the collective unconscious lexicon to grab just the right phrase. It failed. While all this was going on, my mind went a different way and two thoughts occurred to me. "I though the world would look more upside down than it does." "If I ever decide to kill myself, it won't be by jumping off of something high." I dwelled on those odd thoughts while screaming and bouncing up an down on a giant rubber band. They seemed perfectly logical at the time and are the clearest memories I have of that day. Eventually the bouncing stopped, they lowered me to the shore, and I began planning my next trip. The Moisture Meter was just an impulse purchase. The reason I went to Molbak's yesterday was bamboo. Now that I have access to my deck, I can start the garden. Of course now that fall is beginning, I'm more limited in what I can do. 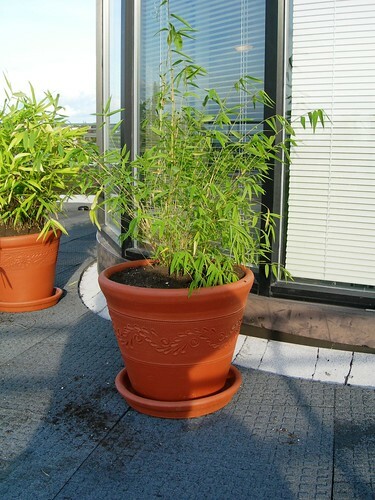 But bamboo should be hardy enough to survive in containers over a mild Seattle winter. 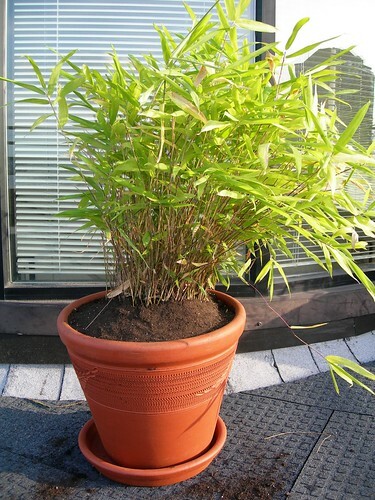 It also grows quickly and has a relaxing sound when the wind blows through it. It may also help keep my apartment cool next summer by shading some of my windows from the sun. According to the tag, this one is an Arundinaria viridi-striatus (Pleioblastus viridi-striatus). They're still rather small, but it's a good start. Apparently, it's now time to sweep up. 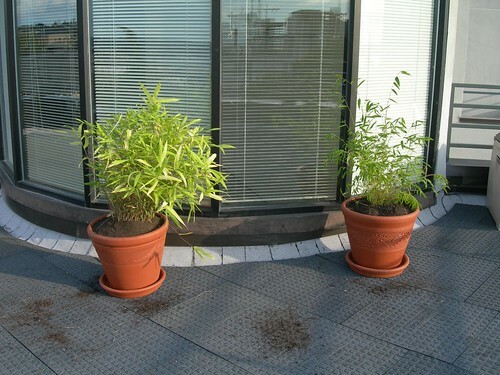 Over watering plants is just as bad for them as under watering, but it's less obvious. When a plant is thirsty, the soil is dry and crumbly to the touch. The plant starts to drop and look unhealthy. When it's had too much water, though, the plant may look okay, but the roots may be drowning. Once the roots no longer work, the plant will die. If the surface of the soil is dry, the deeper soil -- the soil down by the roots -- may still be soaked. I use a moisture meter to make sure I don't make that mistake. The meter has a probe on one end and a gauge on the other. I plunge it quickly into the soil and it tells me how wet it is in there. If it's too wet, I don't water it. For the past few months it seemed I watered everything perfectly -- the moisture meter said nothing was soaked. I was proud of that for a while, but then I began to think it just didn't seem right. So I picked up a new one to double check. Here they are side-by-side in my ficus. They give two completely different responses. I threw out the older one. 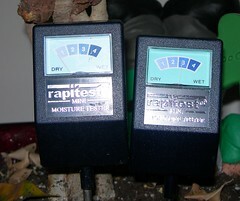 The lesson is to use a moisture meter if you can. And if your older one give strange results, it may be time to replace it. I love the signs the put up in parks reminding people not to be complete idiots. Here's one from Yellowstone that I posted once before. It still makes me laugh. Hold on to your hat, kid. I spent an entertaining evening at Verite Coffee/Cupcake Royale on Wednesday. Monica Guzman, the Seattle PI on line reporter and blogger, organizes a weekly meetup for readers and followers of the Big Blog. While the announcement is right there on the PI, it seems most people attended based on Twitter announcements. So I had coffee with Monica, Jason, and Hal. It was an interesting discussion spanning the Palin Yahoo! controversy, corporate blogging policies, technology, CES, and, of course, Twitter. It also opened my eyes to the other technology centric events going on in Seattle, and open to the public. There are more than I expected, though, had I thought about it, I might not be surprised. I'll have to attend more of these events in the future. These gatherings are weekly affairs, held at different locations in the Seattle area. If you live in Seattle and are interested in these topics, stop by one of the gatherings. 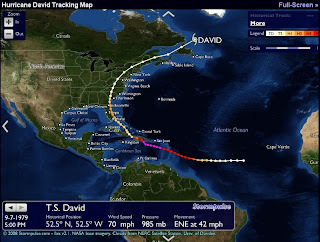 The above image shows the path of David -- a category 5 hurricane that traveled the length of the east coast in 1979. It's the first hurricane I remember being aware of. 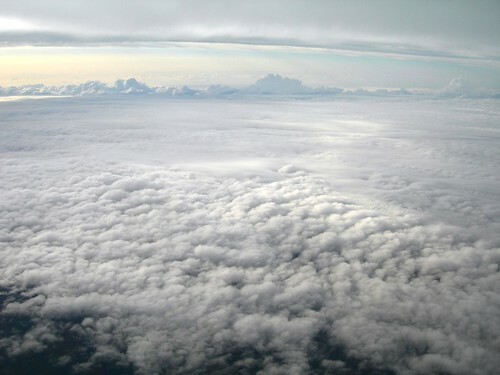 New York would often get the remnants of storms, but this one was different. In the days leading up to the storm, the new casters were advising everyone to take precautions. We put giant masking tape Xs on our windows because that would allegedly keep them from breaking in the storm. The city was filled with Xs on glass. We were warned about tornadoes in Manhattan. School was canceled for the day of the storm. By the time the storm reached New York City, it had weakened considerably. I recall a lot of rain and wind, but no major damage in the area. It was barely a tropical storm. The Caribbean did not do as well. David is blamed for more than 2,000 deaths there. I bring this up because I just found Stormpulse. It's a fascinating site with huge amounts of data and easy to read map. It includes hurricanes and tropical storms going back to the 1850s. 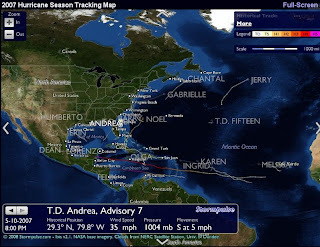 You can look up the storm track and stats for any hurricane in that time. It shows the position, time, and wind speed throughout the lenght of the storm. Wondering where Ike went? Here is is. It's a fascinating, interactive, and data rich site for anyone interested in these amazing and dangerous storms. MS Money Plus error: "This operation cannot be performed"
Two years passed since I last bought MSFT Money. That meant I could no longer use it for online banking. It makes little sense to me why they cap the banking service at two years, other than to make people purchase the updated version. I didn't need any of the new features. I've been pretty happy with the feature set for the past six or seven years. Regardless, I had to upgrade if I wanted to continue to use on line banking in the same way. The latest version of Money -- Microsoft Money Plus is no longer available in retail stores. You now have to purchase it and download it from Microsoft or a different vendor. I'm still a fan of shrink wrap software, so this was mildly frustrating, too. Since I don't like Quicken, though, I bought and downloaded Money. I made a back up of my data file and the downloaded application. Next, I installed the new software. It seemed to work well, and it seemed to import my file properly, but then the error started. "This operation cannot be performed." It gave me the same option again. And I got the same result. This went on for 10 or 15 clicks and then I would get to the landing page. Every time I tried to get to that page, it told me 10 or 15 time that the operation couldn't be performed. You can see how helpful that is. Everything seemed to work fine, but those extra 10 or 15 clicks were starting to wear out my mouse. A quick Google search took me to this Live Journal page by Edmund Wong. He apparently went through the same thing. When Money imports the date file from a previous version, it can corrupt the budget data. To fix the problem, delete the old budget. Once you delete the old budget, the error message goes away and you can create a new budget. So now instead of an old budget that I never used, I now have a new budget that I'll never use. And that's what we call progress. Saturday Night Live was a disappointing premier this weekend. There were some great spots on it, but other parts were disappointing. If this was in the middle of the season, I might have had lower expectations, but the writers had all summer and they gave us an obnoxious waiter sketch and an incompetent political-comic sketch in the middle of the news. The ugly kids bit was an interesting concept, but the sketch didn't really go anywhere. The "Cathy" bit was another decent idea that they didn't do anything with. The Charles Barkley sketch had some interesting ideas that they just didn't execute on. The Bela joke was almost there, but they didn't quite finish it. In fact, many of the sketches had an unfinished quality to them. They had good ideas but fell apart in the story within the sketch. They put the ideas on display but didn't really do anything with them. The whole show seemed like it was rushed from the brainstorming stage to the performance stage. That said, they did somethings very well. They used Michael Phelps appropriately. It's always great to see a Shatner cameo. The Sarah Palin/Hilary Clinton sketch was brilliant (odd since that was the most time sensitive). The Glove infomercial was right on. One of my favorite sketches, though, was the T Mobile sketch. When T Mobile was originally airing the commercial, I thought it was a bit creepy. SNL captured that aspect of it and then ran with the concept. If you are not familiar with the ad, the first segment of the SNL parody is a recreation of it. Basically, T Mobile let people designate their 5 favorite contacts for free calling. A teenage girl names her favorite friends (all girls) and her brother then names those exact same friends, noting that her friends are hot. When you she objects and complaining to her parents, her father suggests it's her fault for having hot friends. So while there were some highlights this week, they are off to a rough start -- especially coming off hiatus. A couple months ago, when my Mother was in town, we took a day trip down to Mt. Rainier. Her post about the park is here. To take the most popular route through the park you actually have to first pass the volcano and go to the entrance in the Southwest corner. It's about a 2-2.5 hour drive from Seattle. 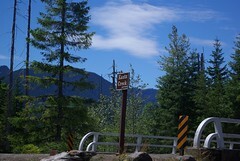 The route through the park follows Paradise Road to Steven's Canyon Road. That eventually takes you to HWY 123 and then 410. The path out of the park took us up the east side of it and eventually through Auburn, WA. You can probably get through the park in an hour if you don't stop, but why you want to do that? 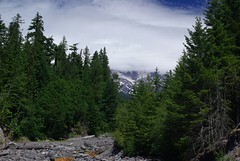 Shortly inside the park we came to one of the first viewpoints -- Kautz Creek. As you can see, it was a beautiful day. This should be a perfect day for volcano viewing right? Well, here's the view of the mountain, 180 degrees from the picture above. The top of the volcano is wrapped in clouds. So for much of the day, we had a great view of the base of it. Regardless, there were plenty of great views. 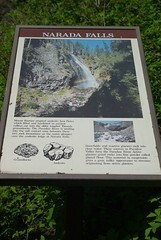 The park is filled with waterfalls. 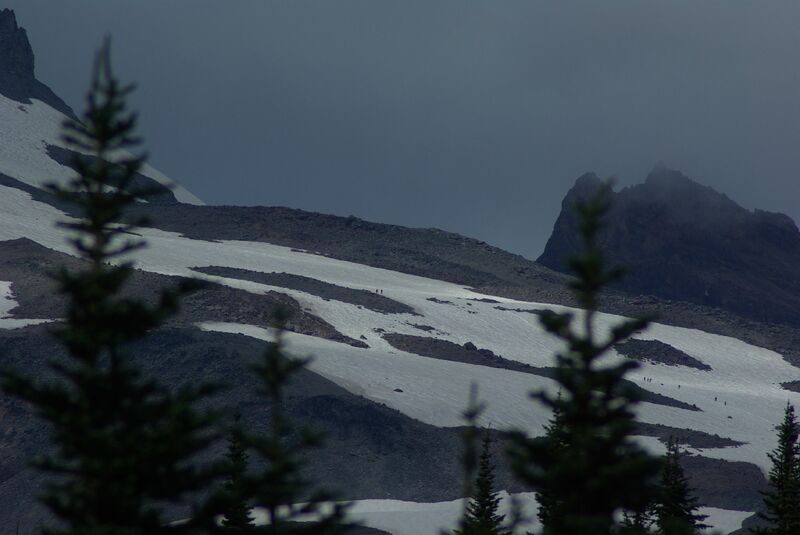 After all, all that snow on top of the mountain has to go someplace. 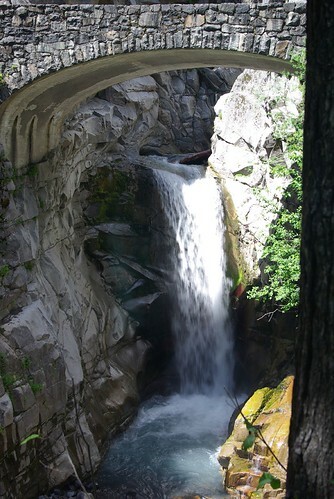 A short distance later, we made it to Christine Falls. This water fall was nicely framed by the road bridge. Nature can be an impressively stubborn beast. 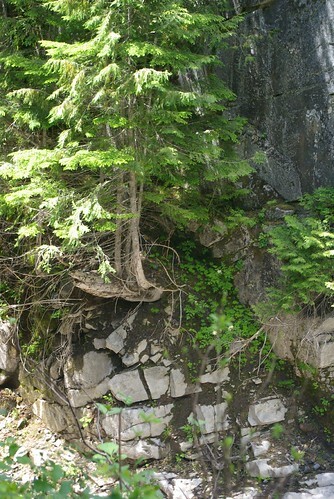 Here a tree is growing out of a rock wall. 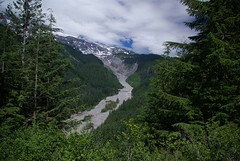 Mt Rainier has a wide assortment of glaciers that grow and contract over the years. In the nineteenth century, the Nisqually glacier extended all the way past the bridge in the center of this picture. It's a bit smaller now. 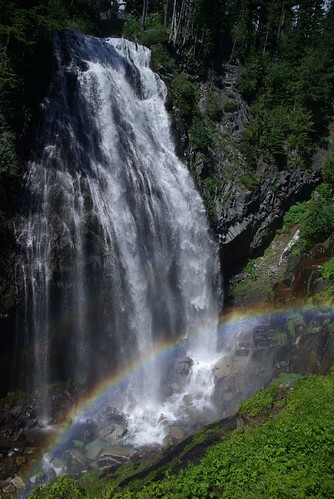 A few more miles down the road, and you reach Narada Falls. 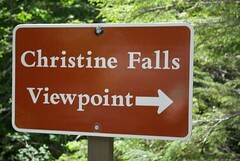 There is a short, steep trail to the best vantage point. And from that vantage point, you can almost always see a rainbow down below. 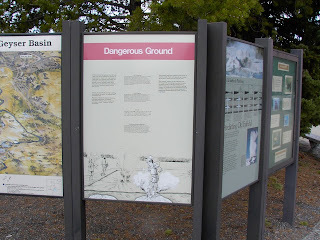 Eventually, we reached the Jackson Visitor Center. I believe this is the highest point in the park you can reach by car. The volcano continued to hide. It's tough to get a sense of the scale of the volcano. If you click on this image, it will take you to a larger version. See the tiny dots on it? Those are people climbing it. The meadows at the foot of the volcano are known for amazing summertime bursts of color and thousands of wild flowers. This year, they were still buried under feet of snow. It was an odd Spring apparently. 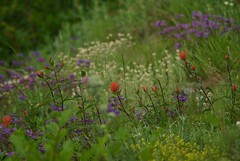 There were still a few wild flowers on the way our out of the park at the lower altitudes. 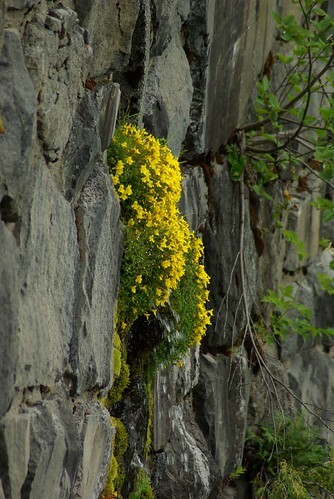 And this one, which I used as my example yesterday, features a bundle of flowers growing out of a drainage hole in the wall. 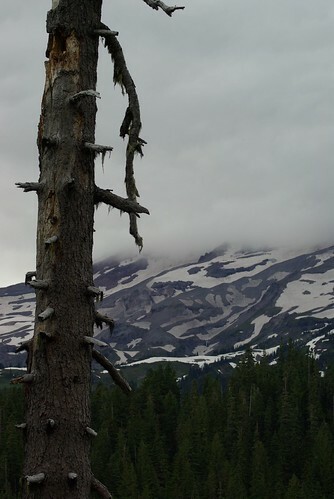 Mt Rainier is a beautiful park to visit. The volcano is amazing whether you see it from above or below. Even when you can't see it. I took a bunch more pictures, too. Some of them are available here. I'll add more in the coming months, too. When you take a digital picture, the camera attaches all sorts of data to that image. Most camera users are familiar with the basic data -- date, time, file name, etc. But there is a lot more information a camera can put in the picture. That inlcudes things like exposure time, ISO settings, zoom, flash, white balance, camera serial number, number of times the camera has been used, and so much more. By understanding those settings, you can learn more about your pictures, your camera, and your skills as a photographer. Some of it may also be useful in photo editing. This data is called EXIF data. Sometimes it's difficult to access without the right software. I'm currently playing around with PhotoMe, which is a free, downloadable tool that will show you all the EXIF data on a picture. You can download a copy here, and start playing with it. How much data is in this photo? I don't fly United often, but when I do, I enjoy listening to Channel 9. Channel 9 is the channel (obviously) on the plane's inflight entertainment system that broadcasts the plane's radio communication with Air Traffic Control. You can list to the ATC centers across the country as they tell your pilots what to do and where to go. You listen in as your pilots talk back to ATC. And you can listen to all the ATC communications with other planes in your area and on your frequency. It's in the arcane language of ATC-Pilot speak, but after a little while you can figure out most of what they're saying. I'm amazed at how fast the flight seems when I zone out listening to the hypnotic rhythms of flight levels, turbulance warnings, directions, and assorted heading requests. Seven years ago this morning, Channel 9 users had a different experience. I wasn't flying that day, but Putt4Eagle was on a flight from Chicago to Phoenix. A few years ago, in a chilling post on Flyertalk.Com, he recounted his experience listening to Channel 9 as the FAA shut down all US air travel for the first time in history. On 9/11, I was listening to Ch. 9. I was on a flight out of ORD to AZ (757) seated in 5F. We had just taken off and where climbing to cruise. A flight out of Rockford, IL was squeezing between us and the UA in front of us. I watched as he lined up to get on the highway westbound. Then, abruptly, the Rockford flight called ATC and requested immediate clearance to return to home. ATC responded with some quick direction and asked if they were experiencing trouble. No, just directed to return home by company pronto. Hmmm, strange I thought. Then the UA in front of us requested emergency clearance back to ORD. Loooong pause from ATC. Now, this is Chicago Center air space. There are no pauses. Certainly not 30-40 seconds of dead air. Hmm, man that is weird, I thought. Then like a starters pistol went off, the comm light up. Another plane req. clearance, then another, another.... boom, boom, boom. Nothing from ATC. I nudged the guy next to me and said put on Ch. 9. He could see by the expression on my face, I was serious. ATC got on the air and started by saying this was going to go quick and pilots needed to listen up. "Protocol responses are not required, just do exactly as I say quickly". Then it began. "UA ###, turn right heading blah, blah expect Springfield airport. SWA ###, turn left heading blah, blah expect Rockford. Delta ###...." This went on for about 3 solid minutes before I rang the bell for the FA who was passing out breakfast. Our number had not yet been called. The FA came by and I said "We are all going back to O'Hare, they are landing every plane in the sky. What is going on?!?" She looked at me in disbelief and kind of leaned down to look out the window. I could see that she was about to start to tell me not to worry about it when we pitched right at about 45*s. It was so quick it nearly dumped the FA in my lap. I don't know Putt4Eagle, but this post stayed with me from the first time read it. My Mother was in lower Manhattan that morning. Her story is here. In my experience when a person doesn't know what to do with himself, he will check his email. So with a blank and troubled mind I strolled into the office of the pension, and stood in line waiting for the one super-slow email connection. I wonder how much more I could get done if it wasn't for One More Thing. Each of these activities may only take a few seconds. I can do them while I'm waiting on hold, or while I'm waiting for Windows to do something. Or for a computer to reboot. Or in between big projects. The do a great job of filling those small gaps. The problem is that anyone of these tasks can lead me astray. What starts out as a 30 second task can easily turn into a 5 minute or 10 minute task. And when I factor in a bunch of them, it adds up. The result? Well, I have about 20 "project" blog posts I haven't had time to write because all these little things during the day interfere. I'm beginning to think that trying to make the best use of those stray minutes throughout the day is actually counter productive. I stumbled across this link from Discover.com on Fark.com. There are a few too many exclamation points in the article, but it's quite interesting. So the Earth is smooth enough, but not round enough, to qualify as a billiard ball. I didn't know about these other moon-like-but-not-quite objects. It looks like I have some reading to do. I took these pictures a couple years ago. I found the look at texture of the bridge parts to be oddly fascinating. 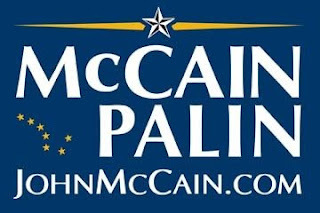 As I watched the coverage of the RNC I saw all the McCain-Palin signs, and in the vein of Brangelina and Bennifer, it wasn't long before people were referring to the Republican ticket as McCalin. Thus a plan that was born in the early nineties was activated. 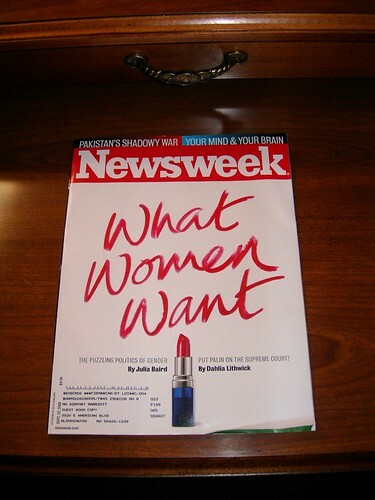 In the early 1990s, the a shadowy organization went to work. They saw the potential of Ralf Reed and Newt Gingrich leading a coalition of Christian Conservatives to take over the Republican party. Their prescient move, before the Contract with America reached the media, would take nearly 18 years to come to fruition, but it is happening today. This shadowy group is determined to take back the party from the religious right by torpedoing the 2008 election and handing to the Democrats. Don Von Tress was an early player in the conspiracy. He worked his Nashville connections and partnered with Billy Ray Cyrus. 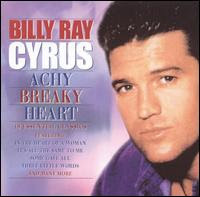 Billy went on to record Von Tress's song, "Don't Tell My Heart" (renamed "Achy Breaky Heart") and reach the top of the country music charts. Cyrus would go on to be hated by millions of people who wanted to throttle anyone who played that song. But Cyrus accepted that sacrifice for the good of the organization. As the years went by, Cyrus and the organization called in some favors from the leadership of the Disney organization. The result of this careful, long range planning was the creation of Hannah Montana and the Hanna Montana TV series. Early in the first season, the producers cast Selena Gomez as Hannah's evil arch rival, pop star Mikayla. Naturally, viewers hate Mikayla, the upstart who causes all kinds grief for the All-American Hannah. Said out loud Mikayla sounds an awful lot like McCalin, doesn't it? Clearly, Disney, Cyrus, Tress, and the shadowy organization are working to make the populace believe that the McCain-Palin ticket is wrong for America. They are saying these candidates will undermine all that is good and pure about America, as embodied in Miley Cyrus's Hannah Montana. Further, by casting Gomez, an actress with a latina sounding name, as Mikayla, the organization is trying to tie McCain and Palin unfavorably to the immigration debate. With this plan, they expect to alienate mainstream, apple-pie America from the McCain-Palin ticket. Now they ensured an Obama victory in November, the organization had to break the grip party leadership has over the Christian Conservative vote. They had to alienate that wing of the party from the McCain-Palin camp. So they went back to Mikayla and Gomez. They no longer needed a name that sounded like McCalin. People already associate Gomez with McCalin now. How do they make sure the religious right hates McCalin? Enter the Wizards of Waverly Place. In Gomez's new show, she plays and irresponsible teen age witch. Middle America hates McCain-Palin because of Hannah Montana. The Religious Right hates McCain-Palin because of all the witchcraft. The Republican party leadership loses the support of the moderate Republican wing by blowing the election. The Republican party leadership loses the support of the Religious Right because of all the witchcraft. The shadowy organization seizes control of the party and wins in 2012. I bumped into this on YouTube. It's silly and cute and only 7 seconds and it amuses me. When I flew to Dallas for Tim's wedding, I stayed at the Hampton Inn in Hurst, TX. It's a really nice Hampton Inn. And the folks at the desk are great. When I made my reservation, I screwed up the dates. I was supposed to arrive on Saturday and leave on Monday. When I booked the room though, I booked it so I would arrive on Friday and depart on Sunday. I realized this on Saturday morning when I had already "no showed." When I got to the hotel I talked to the desk agent and explained that I was an idiot. She spent several minutes figuring it all out with the property manager, and they took care of it. I really appreciate that, especially since I was using Hilton Points for the room and not cash. 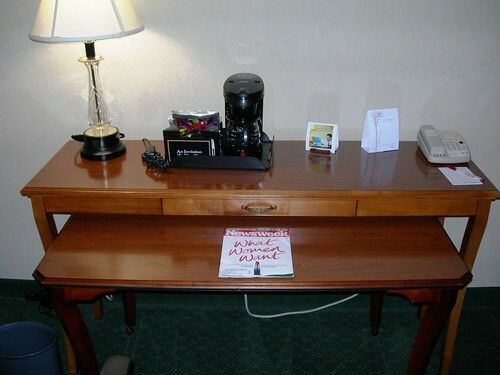 The room itself had a lot of characteristics of a traditional Hampton Inn. Wi Fi was free. They had the new, surprising comfortable Hilton bed and bedding. And there was free breakfast in the morning. Beyond that, the room didn't look like a Hampton. The walls was a darker color than most hotel rooms. 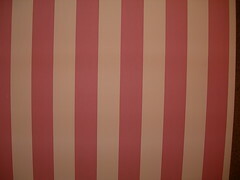 The bathroom had a bold, dark, striped wallpaper. I'm now using a picture of that wallpaper as my Windows wallpaper. There was couch against one wall, and a chair/ottoman combo in the middle of the room facing the TV. 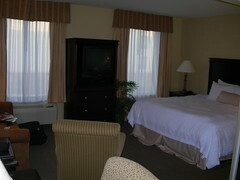 So if you need a decent, inexpensive hotel near the DFW airport, check this one out. Recently Wired profiled Shai Agassi and his company, Better Place. 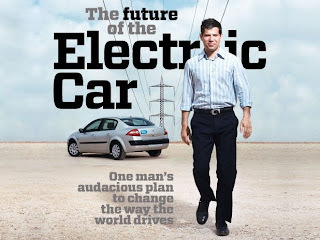 The company is pushing electic cars and is working on a pilot rpogram in Israel and Denmark. What makes things different is that he approaches is like the cell phone model. The plan is not to make money selling cars; it's to make money selling subscriptions to battery charging stations and battery swap facilities. Speaking without notes, Agassi roams the stage, preaching the inevitability of his plan. He has a way of describing things that is never zero-sum; everybody wins in his version of the future, even when he's selling massive disruption. "For the car companies, we made it simple," he says. "We separated the ownership of the car and the ownership of the battery. See, car companies don't know how to assess the life of the battery. So they go through these complicated programs of testing them for a long period of time. And we told the car company, you know what? Just like you don't sell a car with a card that says 'Here is oil for the life of the car,' you don't sell cars with the batteries for the life of the car, because the battery is crude oil." He explains that his plan alone, once scaled up, could produce a 20 percent drop in the world's CO2emissions. And he wasn't stopping there. "If we also buy clean generation, we reduce the price of clean electrons so that at the end of 10 years, clean electrons are cheaper than coal-based electrons, and nobody builds another coal plant at that point. That's another 40 percent of CO2 emissions; that's the treaty Tony Blair is now working to get for the world by 2050. I'm telling you, we can get there a decade after we finish the car side. We can get there in 2030—60 percent reduction in our CO2 emissions." It's a great story. I don't know if it will work, but it is refreshing to see new, potentially plausible ideas and business models in this space.